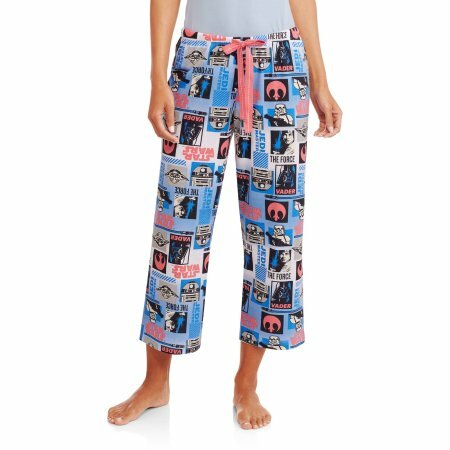 Description: Star Wars Women's License Knit Sleep Pant: 60% cotton, 40% polyester Sleep pants Knit construction All-over graphics of various Star Wars characters and logos Covered elastic waistband with flat drawstring Colorful graphics Relaxed fit Officially licensed product Available in sizes S - 3XL Machine wash cold with like colors, only non-chlorine bleach when needed, tumble dry low, do not iron decoration, do not dry clean. Star Wars Women's License Knit Sleep Pant: 60% cotton, 40% polyester Sleep pants Knit construction All-over graphics of various Star Wars characters and logos Covered elastic waistband with flat drawstring Colorful graphics Relaxed fit Officially licensed product Available in sizes S - 3XL Machine wash cold with like colors, only non-chlorine bleach when needed, tumble dry low, do not iron decoration, do not dry clean. Enter the details of an online store that carries UPC 768762162175 below. The store's URL must go to a valid product page that has the product displayed with pricing information.